Oil prices are trading significantly lower this morning after comments from Saudi Arabia’s energy minister. Crude oil this morning is trading at $50.95, down $1.94 from yesterday. Fuel prices are trading lower as well, giving up recent gains. Diesel prices are trading at $1.8468, down 4.2 cents. Gasoline prices are at $1.4001, a loss of 4.6 cents. It has been a wild ride for oil markets in the last quarter of 2018. 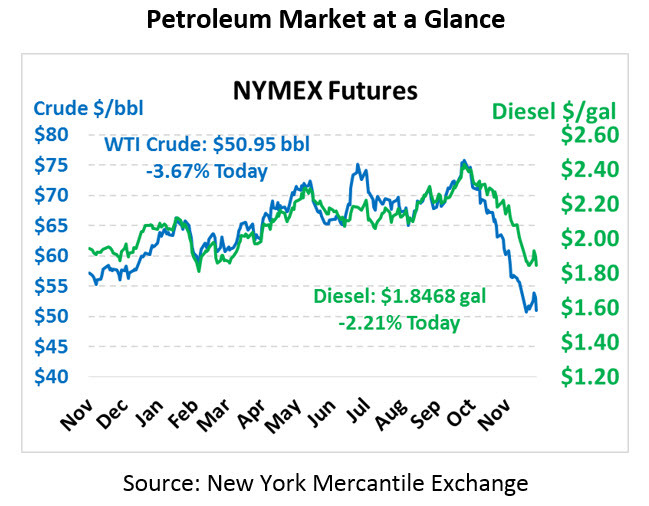 Oil prices fell from 52 week highs ($76/bbl) in October to 52 week lows ($50/bbl) in November. Planning for Iran sanctions tightening supply markets, Saudi Arabia increased supply, pumping at record rates to contain prices. 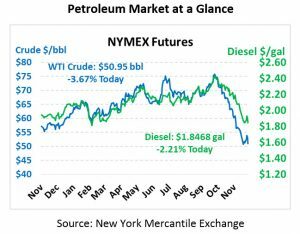 The temporary Iran sanction waivers issued by the Trump administration helped drive oil prices lower, and the fear of oversupply and weakening demand due to a global economic slowdown caused the levels we see today. This volatility is the backdrop for today’s OPEC meeting. The OPEC meeting in Vienna will help set the direction for oil prices for the beginning of 2019. Saudi Arabia is under pressure from the U.S. government not to push up prices; the fallout from the murder of journalist Jamal Khashoggi has given Washington more leverage to influence the Kingdom’s strategy. A supply cut would steady oil prices, while helping U.S. shale oil gain market share. Back in 2014, the Saudis pumped at high levels to keep prices low to fend off U.S. shale oil production. The strategy hurt U.S. shale, but shale was resilient and bounced back after 2016 production cuts from OPEC. At the G-20 Summit last week, the U.S. and China agreed to a temporary truce in the ongoing trade dispute, but traders continue to fear weakening demand and a possible oversupply situation for 2019. Qatar leaving OPEC in January throws another variable into the mix for 2019. This morning, Saudi Arabia’s energy minister made a surprise announcement that the Kingdom does not believe production cuts should be much more than 1 million barrels per day (MMbpd), given Canada’s planned cut of 325 kbpd. Markets have generally been expecting a 1.3 MMbpd cut or more, so Saudi’s conservatism has produced another round wave of selling this morning. The Saudis have the most influential voice in OPEC, and typically set the tone at group meetings. If the group decision is 1 MMbpd by the end of tomorrow, expect prices to remain weak, though perhaps slightly higher than today. A larger cut would cause prices to leap higher, while any lack of progress would likely leave prices in the low $50s early in 2019. Whatever the final outcome of the meeting, OPEC will need Russia’s agreement to succeed, but Russia has wavered back and forth on the matter, saying both that the current prices are acceptable to them and also saying that a supply cut may be needed. Most recently, Russia and Saudi Arabia at the G-20 Summit indicated that they would decrease production by a yet to be agreed upon level.